Richie Unterberger promotes Won't Get Fooled Again: The Who from Lifehouse to Quadrophenia. 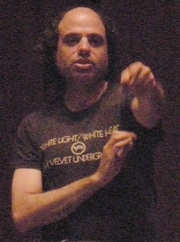 Richie Unterberger promotes White Light / White Heat: The Velvet Underground Day-by-Day. Richie Unterberger promotes The Unreleased Beatles: Music and Film. Richie Unterberger is currently considered a "single author." If one or more works are by a distinct, homonymous authors, go ahead and split the author. Richie Unterberger is composed of 2 names. You can examine and separate out names.